The first time I jumped out of a plane was on a whim – sort of. My youngest daughter and I had mentioned it might be fun to try, but that was as far as it went, until Lori heard a radio spot about an early season special on tandem jumps at Skydive Chicago. Was I up for it? Absotively! So there we were, two eager beavers signing multi-page waivers with harsh sounding words like death and paralysis, on a Friday the 13th then gearing up to jump out of a perfectly good airplane. I’m not crazy – really! But I do hear a different drummer in my head some of the time. Okay, most of the time. And before you knock it, you really have to try it. In all, I did 22 jumps. Nothing even remotely close to the numbers serious skydivers rack up, but each jump was a memory to savor. I managed to land my first solo jump in the trees, much to my chagrin and my kids’ head-shaking snickers, but I got better. Learned how to land it standing up like I was stepping down off a curb. I learned how to pack my own chute and screwed up the courage to jump it. And I got my class A license. Skydiving is an extreme sport, and for most skydivers, it’s all about the freefall. That streaking minute or so when you are falling toward the earth at terminal velocity. The brief seconds when you can flip and roll with ease, or fold your arms back and swoop like a hawk as the earth rushes up to meet you. 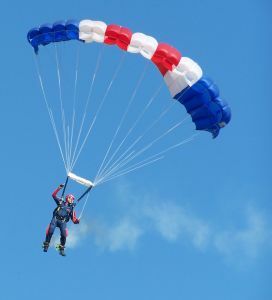 Most skydivers seem to wait until the last moment to pull the ripcord, and many fly high performance canopies designed to get them to the ground very quickly. But, while I admit to being something of an adrenalin junkie and loved the feeling of flying, for me the sweetest part was the canopy ride. I liked pulling as soon as I could and still manage to land on the drop zone. I savored the moment I was snatched from my perilous descent so abruptly that it took the breath out of me. There was a great deal of satisfaction in looking up at the fully deployed chute spread above me just waiting for me to grasp the controls and guide it where I wanted to go. In the sudden hush, so different from the boisterous sound of wind rushing past at stinging speeds, I thoroughly enjoyed every minute of my ride back to earth. The experience was irresistible and one I won’t ever forget. I haven’t been skydiving in a while now for a variety of reasons, but you never know. One of these days, I just might have to find another perfectly good airplane to jump out of again.